I turned 13 today. And it really pisses me off. See, about 15 years ago, when I was in college and surviving on Raman noodles and day-old French bread, I decided I needed to own a scale. I went to the local Wal-Mart (back when they weren’t all SUPER) and purchased the cheapest scale they sold. Over the years, this scale has become a friend. Each day I’d step on it just before my shower and make sure it was telling me the same thing it had the day before, and usually it did, give or take a pound. Over the years, the scale has become less accurate. I know this because after my daughter was born I started attending a gym on a regular basis and used their fancy scale. It always said I was exactly 7 pounds more than my scale at home did. This fact made me love my old scale even more. Through my second pregnancy my scale told me I was gaining less weight, topping out at a smaller number and recovering from my pregnancy even quicker than that damn clinic scale. 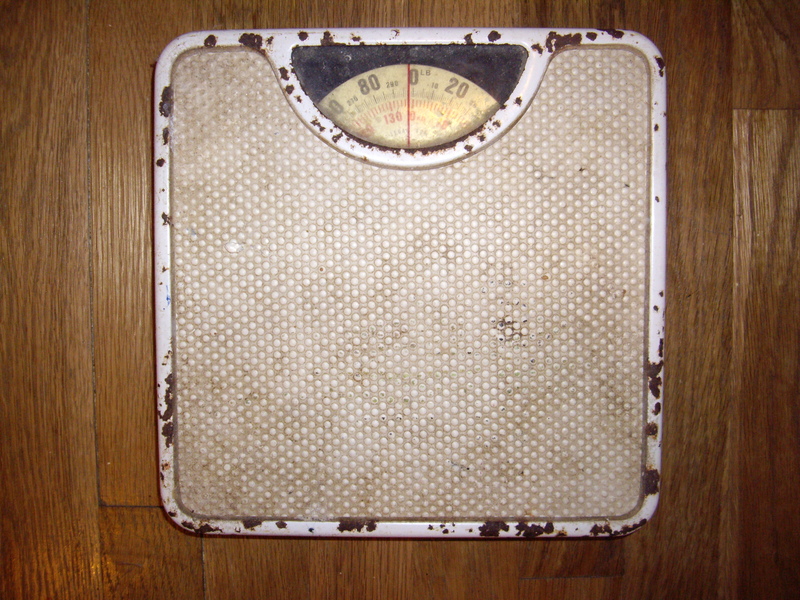 And thanks to my trusty old scale, I’ve been back to my pre-pregnancy weight for almost six years now. I’m not stupid. I know my real weight. I know I am about 7 pounds heavier now than I was before getting pregnant, but I still love the sweet lies my scale tells me. And when I am bloated and carrying an extra 4 pounds I can just reach down, adjust the dial on the scale and boom, just like that I am still at my pre-pregnancy weight. #ScaleLove. Six years ago, after my son was born, I started #running. Shortly thereafter I started #swimming again and a couple years after that I started road #biking. I became an athlete. And as an athlete, I became even more obsessed with my #weight. I started wondering about my body fat and found the generic calculation for it. If I took my weight and my height it basically said I was 23% body #fat. I was not impressed. After perusing a Runner’s World Magazine one day I came across and advertisement for The #Ironman Scale. I became fascinated with it. I went on-line and learned about all the information it could give me by just standing on its beautiful glass surface. It would tell me my weight, Body Fat %, Body Water %, #Muscle Mass, Physique Rating, DCI/BMR (whatever that it), Metabolic Age, Bone Mass and Visceral Fat! So I started hinting to my husband that I might want one for Mother’s Day. I knew it was way too much money to spend on a scale, easily 32 times the cost of my current one. But just like magic, it arrived and he gave it to me. 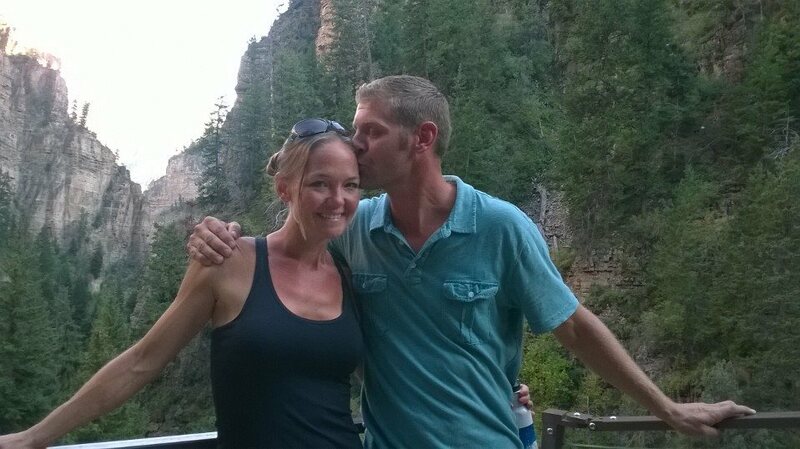 #HusbandLove. It took a while to input my data. It needed to know my age, gender, height down to the half inch, and it also wanted to know if I was an #athlete: YES! Yes, I am thank you very much. I stepped on the scale. I was instantly insulted by the weight it reported; approximately 6 pounds more than my current scale. But my anger dissolved the next instant when it reported my % body fat: 14%! Damn right! I was in love. It rambled off the other numbers, it said I was hydrated, I didn’t care about muscle mass, my physique rating was 8 (thin/medium build with muscle but not a waif), it gave the BMR, and it said my metabolic age was 12! That’s the lowest it goes. And my visceral fat was a 1, and just so you know anything under 12 is considered healthy. 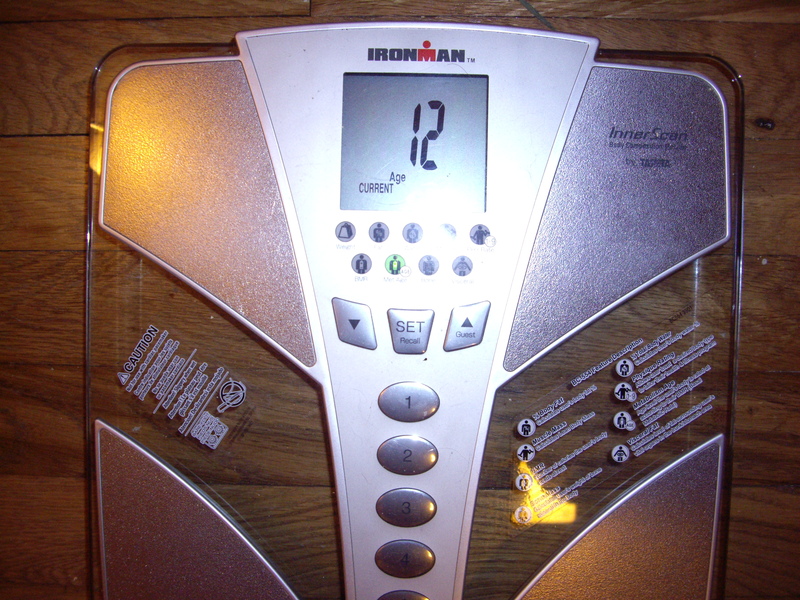 This scale was whispering beautiful things to me; it was my new best friend. It didn’t take long for the excitement of the scale to wear off. The only number that changed was my current weight, which would fluctuate by a couple of pounds, but all the other numbers pretty much stayed the same. Most days I didn’t even bother to read them. Today I hung around to read all the numbers. That may have been a mistake. My weight was up a whopping five pounds, my body fat was 17%, and my age was 13! The most astonishing number was my visceral fat: it was 2. What in GODS name is happening! You have to understand. My visceral #fat didn’t just go from 1 to 2, it doubled. It may as well been 25 to 50. How was I suddenly a year older? I’m 12 not 13! And it isn’t like I’ve been slacking either. I’ve been biking and running and swimming…in excess even. I grabbed my husband, told him to get on the scale. I instantly felt better. He went from being 12 years old to being 17, HA! At least I’m not that old. His body fat was up to, from 9.3 to a staggering 15%. Sadly, his depressing numbers made me feel a lot better. Maybe there was some electrical glitch affecting the scale, maybe we ate something really wrong the day before, who knows? But at least I wasn’t the only one who aged overnight. Still, I felt a little like crying. This stupid scale and its twisted honesty was bringing me down.